Life got a little bit busy last week, and I neglected to do the week 2 assignment in the Women Living Well challenge, so I’m catching up this week! The richest heritage that parents can give is a happy childhood, with tender memories of father and mother. This will brighten the coming days when the children have gone out from the sheltering home, and will be a safeguard in times of temptation and a conscious help amid the stern realities of life. My kids absolutely love playing games with mom and dad! Whenever we suggest getting a game out from the playroom, the kids rush down with excitement and bring back that day’s favorite. Daddy always makes the game so much fun, with all his funny voices and teasing. The kids can play games for hours, and even though most of the time I find the actual game pretty boring, I do love to see the expressions on their faces. This past weekend we had a whole day of family fun, not just one night 🙂 We took the kids to the farm and pumpkin patch for some fall fun, spending a good chunk of the day there. For dinner, we decided to eat pizza in front of the television (a huge treat in our house, because we always eat at the table) while watching a couple episodes of Inspector Gadget. It’s an old show, but my kids love it! My daughter and I took turns “fixing” each other’s hair…I ended up with about 8 ponytails all over my head (sorry, no pictures! ), and I braided her hair for her. What kind of fun things do you like to do with your family? 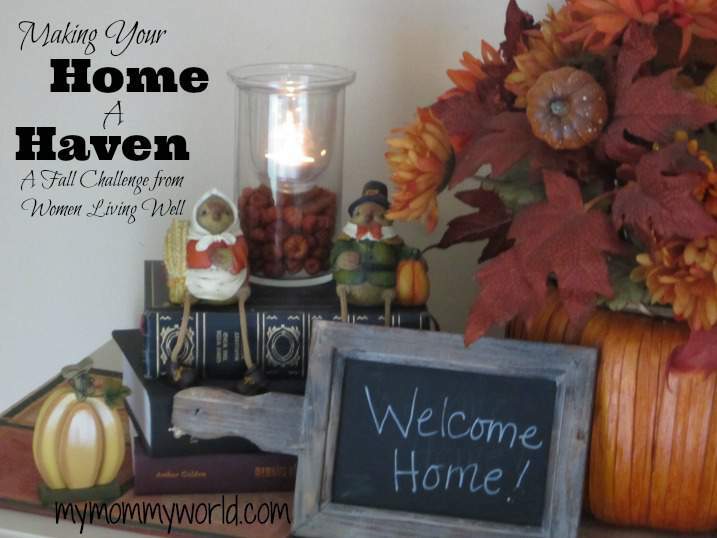 Are you enjoying this Making Your Home a Haven challenge? We had some fun over the weekend with the kids. My husband got down the airplane he and his dad build years ago for our daughter. It usually hangs in the corner of the garage like it is flying. My son had a blast riding in it. Unfortunately the battery for it was dead so it didn’t have any lights or working propeller but he still had fun. My daughter has very fond memories of riding in it too. I saw the picture of him riding in his airplane on Instagram…that is a cool plane! My daughter played Monopoly at the gym for the first time a few weeks ago and now she wants it for Christmas. And no to the pictures of my hairdo! Lol!